Happy Monday everyone! 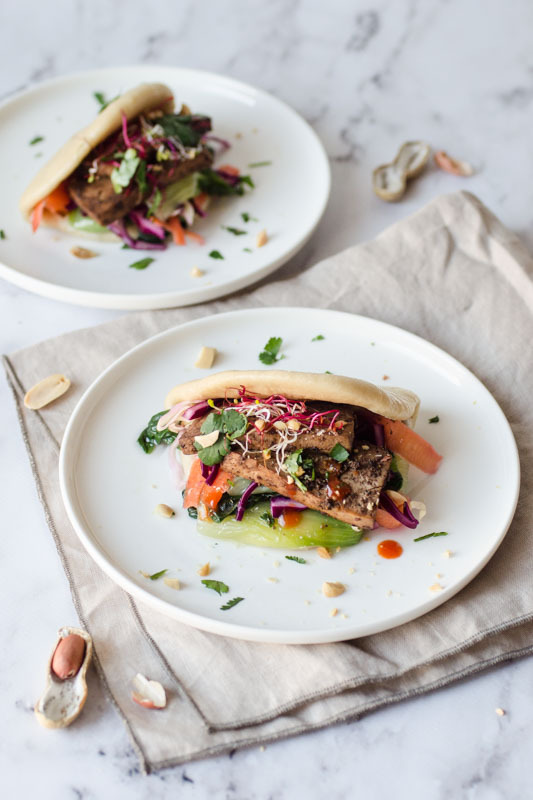 Today’s vegan gua bao post is special because it’s a collaboration with my friend Chiara of Mangio Quindi Sono (literally “I eat therefore I am”), an omnivorous food blog written in Italian. We went to high school together, we’ve been friends for 15 years and naturally a love – and obsession! – for food and props brings us together. 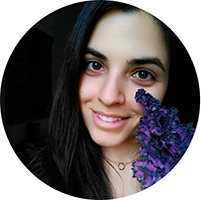 Chiara creates recipes that are not only beautiful but also delicious and very well balanced, and throughout the years I’ve had the pleasure of trying many of her vegetarian dishes. We’d been thinking of starting a collaboration for a while and at last we started a couple of weeks ago. We wanted to make two recipes, to cross-post, but alas one of them didn’t quite turn out so we’ll need to try it again. 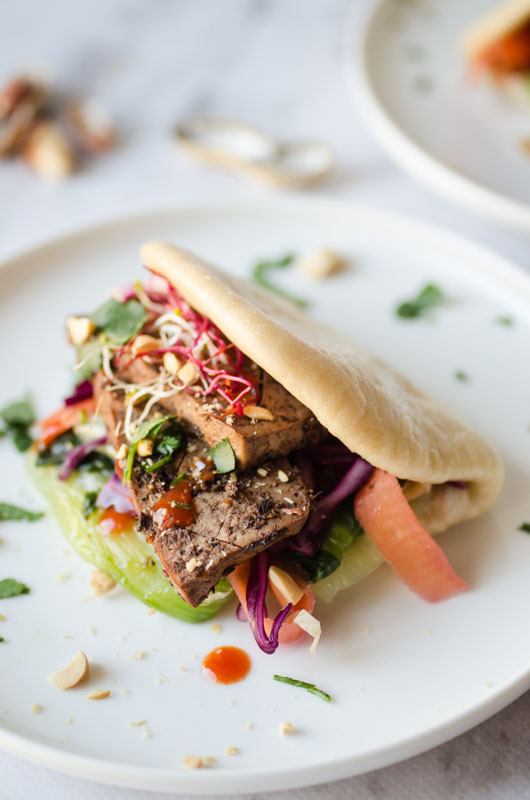 As you may notice, the making of these veganised bao buns is longer than my usual recipes, even though in fact it’s not complicated, there are just various different ingredients to prepare separately. I decided to take advantage of this collaboration and share a more elaborate meal since Chiara’s kitchen is way more equipped (i.e. bamboo steamer) and stocked than mine. 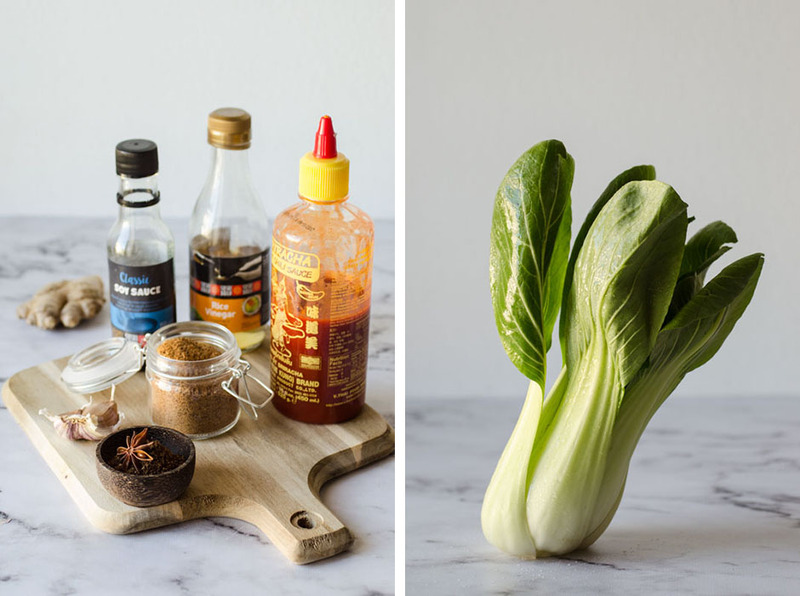 Spices and sauces such as Sichuan pepper, soy sauce, sriracha, rice vinegar, sesame oil and more are all ingredients that I don’t keep in my pantry as I don’t need them but on the contrary she often creates more Asian-inspired dishes. But what are bao? They are simple steamed buns consumed daily in Chinese and Taiwan cuisines as street food, filled with different meats and vegetables. They are round and are cooked with the filling already inside, like big dumplings but made with a bread dough. 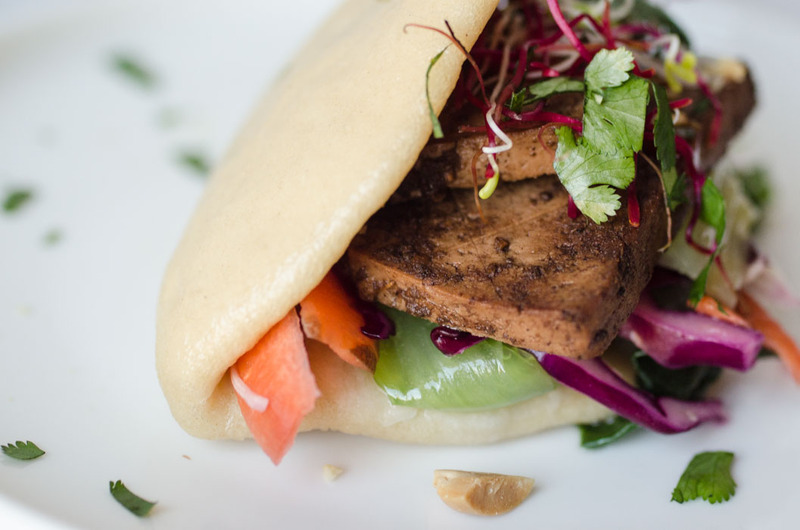 Gua bao are a “flat” variety where the meat is added after steaming. Traditionally they are filled with braised pork belly, pickled mustard greens, peanut powder and fresh cilantro. Compared to the round bao, we thought these would be more photogenic! We tried to follow the original recipe as faithfully as possible but we soon bumped into the first obstacle: where to find mustard greens? We still wanted to use some green leaves and chose bok choy (aka pak choy), a Chinese cabbage, which we stir fried in sesame oil and garlic. Instead of pork belly I used tofu and Chiara decided on a lighter pulled chicken breast, which she made in her slow cooker. Although we both changed the main ingredient we absolutely kept the original marinade ingredients! In a small bowl combine warm milk, water, oil, sugar and dry yeast, stir to combine and let sit for 10 minutes. In a large bowl sift flour and add baking powder and salt. Stir, then add wet ingredients and mix well until incorporated. Knead dough on floured working surface until smooth and elastic, about 5 minutes. Put dough back into bowl, cover with a clean kitchen towel and let rest in a warm spot such as near a radiator, in the sun or in the oven (off but with the light on) until the dough is about 1.5 in size, about 1 to 1 and half hours. In the meantime prepare the other ingredients (see below). When ready, transfer dough back onto working surface and knead again. Divide into 8 equal portions and knead each to form a ball. Let proof again for 15 minutes in a warm spot. With a rolling pin roll each ball out to form an oval shape. Fold each oval over. Optional: cut 8 small rectangles out of parchment paper to insert inside the ovals so the two parts don’t stick together, or dust with flour. 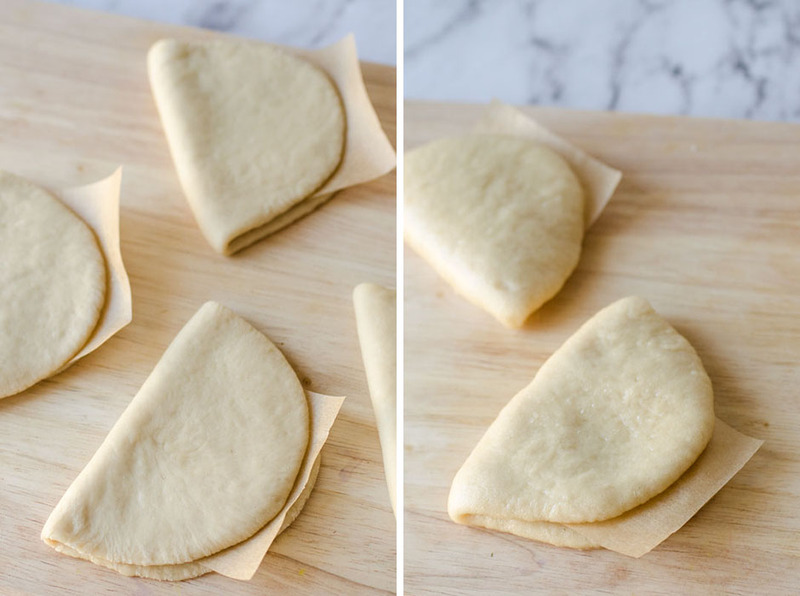 Place bamboo steamer lined with parchment paper over a medium sized pan with a little bit of water (less than an inch) over medium heat and, when the water is boiling, add 2 dough buns (or more, depending on size; remember they will rise), cover and let steam for 5 minutes. Check that they have risen well. Note: if you put too much water it will boil over and soak the buns! Remove from steamer and repeat for the other 6 buns. *5-spice mix: 1 tsp of each, all ground: cinnamon, cloves, fennel seeds, star anise and Sichuan pepper. Add all ingredients (except tofu) to a medium bowl and stir. 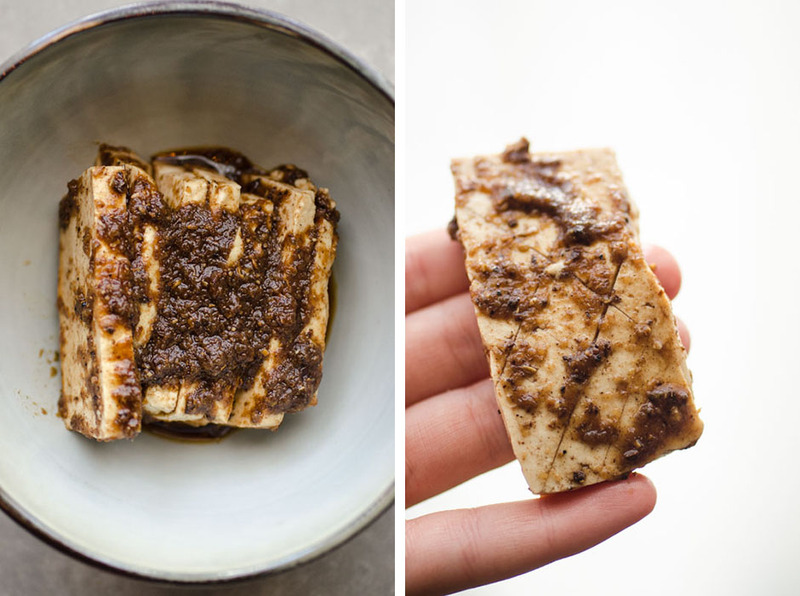 Cut tofu in thick slices (either 8 or 16) and lightly score them with a sharp knife (be careful not to cut through, see photo). Add them to the bowl and toss to coat. Place bowl in the fridge to marinate. Add rice vinegar, sugar and a pinch of salt to a medium bowl. Wash and peel carrot. Use a peeler to make thin ribbons. Remove the outer layer of both white and purple cabbages and chop them super thin wither with the peeler or with a sharp kitchen knife. Add carrot and cabbage to bowl, toss to coat and let marinate for a few minutes. Clean bok choy by separating all of the leaves (discarding any wilted ones) and washing them under running water. Place a medium sized pan over a medium flame, add sesame oil and garlic and let sauté. When golden, add whole bok choy leaves, let stir fry for a minute, add a pinch of salt, let stir fry again for a minute, then cover and leave to cook until just soft, about 5 minutes. Transfer bok choy to a plate. Add tofu to pan along with marinade and let cook, over medium heat, for a few minutes until the liquid has been absorbed, stirring occasionally. Wash, pat dry and roughly chop coriander leaves (stems included, for extra crunchiness). To serve: carefully slightly open each bun and place a couple bok choy leaves, top with carrots and shredded cabbage, 1-2 tofu slices, fresh cilantro, peanuts, sprouts and some extra drops of sriracha if desired. Buon appetito!! !